Surrey Garden Fencing, Cutting Hedge™ fencing based in Working cover areas such as Cobham, Sheerwater, Knaphill, Ottershaw, Ripley, Send and surrounding areas. Surrey Garden Fencing, Cutting Hedge can repair or offer you a completely new installation. 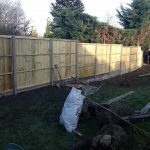 Cutting Hedge Surrey fencing offers both domestic and commercial installations with over 20 years experience in fencing Cutting Hedge guarantees all its work. Surrey Garden Fencing aims for a complete installation from start to finish; all fencing comes with a post and will need to be either wooden or concrete. Building a gravel board is possible with bricks or a standard gravel board. Gravel boards can be either timber or a concrete board. This gravel board as it is called acts as a support for the panel or feather edge timber boards. Panels will be brought on site as a complete fencing board but feather edge is nailed onto a rail called aris rail. 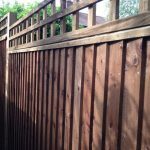 Surrey Fencing installations offer a wide range from dip to pressure treated timber options, The most popular been a pressure treated feather edge panel. This complete panel comes with a manufactures guarantee of 10 years anti rot if it is not resting or touching any soil or rotting debris. Over the past few years, we have seen a new style of western red cedar been installed giving you a very contemporary modern slated finish. This slated finish is used for screening an area that is predominately a focal point. We can install Ipe and Balua hardwood slates or if your budget is low a pine version that can be painted or stained. All softwoods are treated from elements, however, dip, spray, and pressure treated can differ a lot amongst the softwood treatment. We also advise using a good sealer on all wood that is not treated as cedar is not treated. We recommend painting it with Owatrol Seasonite - New Wood Protection for the first 3 to 6 months. After this Osmo 420 UV Protection Oil Extra - with protection against algae that will last 3 to 5 years. Cutting Hedge fencing contractors can build a bespoke fence or implement any wall and fence combination to any garden or garden design. Garden gates and security gates can be adapted to complement a fence. Do contact us today to discuss a free site visit.